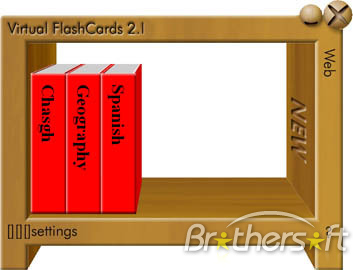 Virtual FlashCards 2 includes the creation of multimedia flashcards, smart study options to maximize study time, an integrated online FlashCard swapping system, multiple print options, and more. FlashCards can be text, pictures (with answer regions), and sounds. Advanced study options show you the flashcards you don't know...more often. Keep extensive statistics of your studying progress and easily share FlashCards online. Study efficiently and quickly - "Smart" study modes optimize learning for you. Plus, in-depth statistics track your progress. Print in multiple formats - double-sided, single-sided, or list. Choose the cards to print, including cards often answered wrong - for a quick review before the test. Qweas is providing links to Virtual FlashCards 2.1 as a courtesy, and makes no representations regarding Virtual FlashCards or any other applications or any information related thereto. Any questions, complaints or claims regarding this application Virtual FlashCards 2.1 must be directed to the appropriate software vendor. You may click the publisher link of Virtual FlashCards on the top of this page to get more details about the vendor.